Any kid who’s going to be hiking more than a couple hours should know how to potty in the woods. 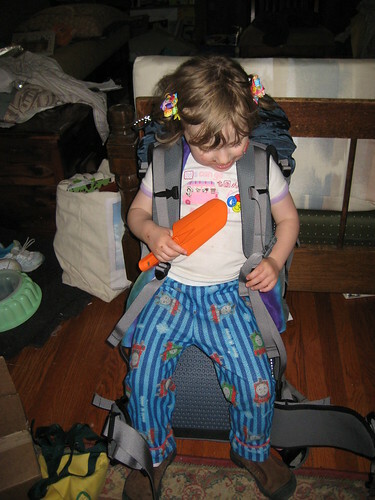 Little ones in diapers are relatively easy – bring the stuff along, and plastic bags to pack it out. We taught Boo backwoods toileting while she potty trained. I was unemployed at the time, and we were putting in a couple hours on the trails several times a week. I put her on the toilet before we’d go out. We’d hike. Sometimes she’d need to pee (again). I’d find a spot, put her in position, hold her steady to avoid wet pants, tahdah. (The avoiding wet pants is key – watch the urine stream carefully, and you’ll pretty quickly find out how your individual kid needs to position herself to stay dry.) I assume boys who are peeing standing up are even easier. As long as they’re old enough to give you that 10 second warning, they will pee. For a few months I hiked looking for potty spots. I didn’t see anything besides safety issues and potty spots. The first few times, I’d get her into position, and nothing would happen. But she just couldn’t hold it until we got to a toilet or a pull-up. Pooping wasn’t much harder. She was not interested in pooping in the toilet. So she waited until we were away from one to demand a pull-up. Which is all well and good until she used up her supply. Again, I quickly found a spot, dug a hole with a stick, and positioned her. Nothing happened. Repeat about 5 times over half an hour, and there was success. Once she did it once, there were no problems. She announced a need, I dug a hole quickly, and it was done. How easy or hard was woods-training your kid? What worked? What didn’t?